Super-Team Family: The Lost Issues! 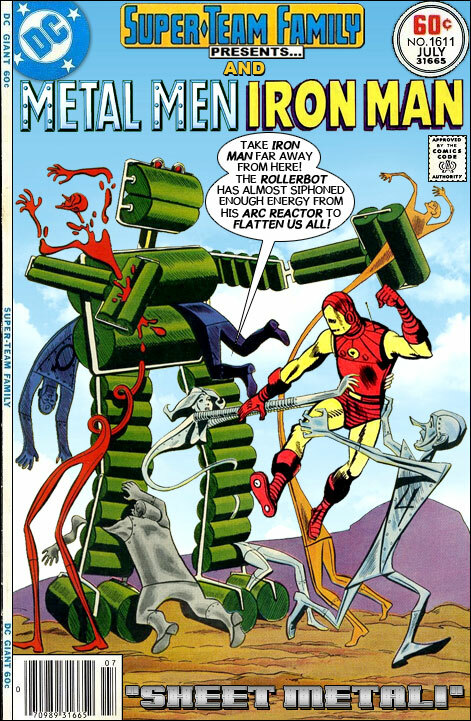 : The Metal Men and Iron Man in "Sheet Metal!" The Metal Men and Iron Man in "Sheet Metal!" I tried, mostly in vain, to get my nieces and nephews interested in comics. I would give them whatever beat up copies or duplicates I had on hand and they gobbled them up but soon moved on to video games and the internet and more modern distractions. The one title I remember my niece really liking was The Metal Men. There is something about their simple designs and personalities that really appeal to kids. I had heard that there was interest in bringing them to the movies and I hope that has not been abandoned - there could be some real potential there. The Roller Robot?! Lol! What issue of the original DC run is he from? I'm mostly reminded of those electronic roller blades Shellhead used to resort to when his foot-jets couldn't get him off the ground. Nice cover as usual. Get MACHINE MAN and G.I. ROBOT in there and we got a serious heavy metal party. @ Anonymous: I was thinking more of IRON Maiden. This one has some well-contrived interaction with Tin and Platinum (aren't they?) and Iron Man. Nice work. You have a Kirby tag - is that really his Iron Man? I would not have guessed. Got to wondering if you'd ever had the Metal Men meet Magnus - another offbeat comic I liked - and I see, of course, you did, back in 2012. Ironically, I am clicking the "I'm not a robot" checkbox - heh. On second look I think it's a Ditko Iron Man. I try to integrate the character's actions when I can but it isn't always possible without looking a bit clunky. @ Ross: most robots in comic book science fiction are clunky, by nature. LOL! Iron Maiden WITH Led Zeppelin. A gold album. Or for a more classical soundtrack, the Anvil Chorus. Ross, have you ever had Mercury meet Quicksilver? Just noticed the caption Sheet Metal!!!! As in; "Sometimes, sheet metal happens." No, it's a wonderful pun as the robot looks like it's made out of mangles. Then, it might have been more appropriate to call it...The Mangler! Red Tornado and ROM in "Sleeper Code!" Batman and Spider-Man in "Rigged Rides!" Wolverine Vs. Snake Eyes in "Silent Slice!"